This call has similar sounds to the wingbones, but has greater volume and therefore I use it as a locator call. It provides a piercing sound turkeys like to answer. It will also do soft low end sounds. Note: All of the suction yelpers, whether bone or turned barrel, are not easy to master. Expect to practice a lot. Results though are very good as not a lot of hunters take the time to master it. I included a picture of 2 current production yelpers so you may see how my calls have evolved. 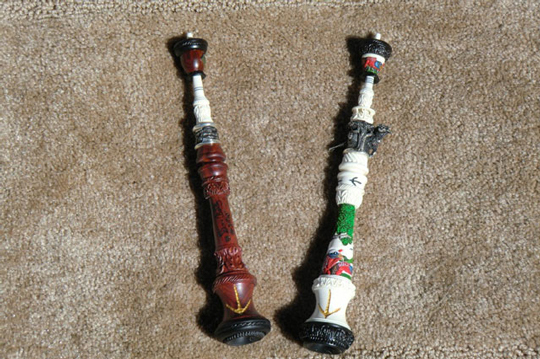 The wood call has one of my acorn mouthstops and a pure silver band. The shape of the call has also changed. The white call is a very ornate Elephant Ivory call that I made for my son. This is an extremely expensive call and one that took many hours to complete. These calls are custom made to the customer's specification. For more information or prices please call or e-mail us.